Sierra Juarez walks through the interface for Transition, an application that connects prospective students with college support services on Sunday, Oct. 22. 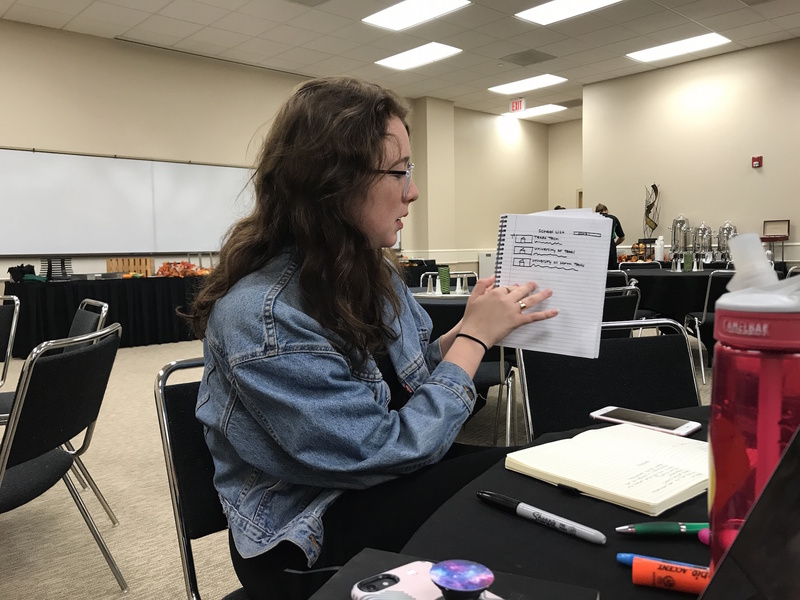 When Tracy Kirk registered for the MediaShift J-School Hackathon at the University of North Texas (UNT), she was hoping to collaborate on solutions to some of the issues facing small-town news organizations. However, Kirk’s original goal took a sharp turn when she shared a recent experience she had while searching for schools with her college-bound daughter. 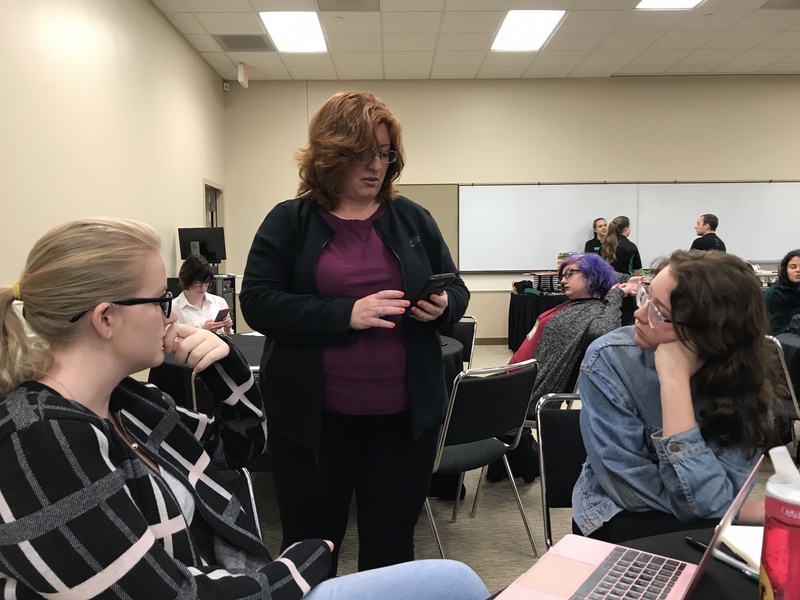 The two-day competition, which was hosted by UNT’s Mayborn School of Journalism, included about 50 student participants and faculty facilitators from journalism schools across the country. Students were placed on one of eight teams — ranging from three to five members — and tasked with developing either a sports or health startup in just about 30 hours. Kirk, a former UNT doctoral student, was placed on a team with Claire Loescher, a UNT journalism junior, and Sierra Juarez, a third-year journalism student at the University of Texas at Austin. As a faculty member traveling with a group of seven students from the Klein College of Media and Communication at Temple University, I was their facilitator. On the first day of the event, Kirk casually mentioned a problem she’s been having, before her team even started brainstorming: Her daughter Zoe, a high-achieving high school senior who plans to study neuroscience, is in the process of looking for colleges. The catch? She has Asperger’s Syndrome, and there’s no centralized, objective list of schools with specialized resources for students with autism. After discussing more than 50 ideas for their pitch, Kirk, Loescher, and Juarez decided that Kirk’s struggle finding colleges for her daughter presented the most opportunities. With their focus narrowed, they then spoke with a number of potential users to help them mold their product. 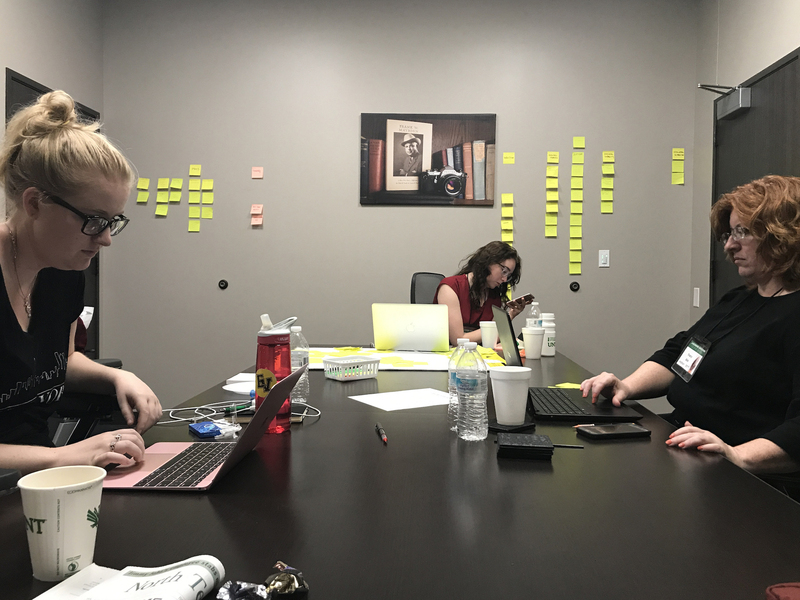 Claire Loescher (left), Sierra Juarez (center), and Tracy Kirk (right) work on their health pitch for the MediaShift J-School hackathon at the University of North Texas on Saturday, Oct. 21. The team interviewed between 10 and 15 individuals — either students with, or parents of students with — mental health issues, addiction disorders, and a variety of other disabilities. The product they pitched, which they named Transition, is an application that connects prospective students with college support services. The main screen of the application, they decided, would have the following categories: Addiction Recovery, Autism, Intellectual Disabilities, Learning Disabilities, Mental Health and Physical Disabilities. Prospective students and their parents could then select a category, and choose the services they’re looking for in a college. Claire Loescher (left), Tracy Kirk (center), and Sierra Juarez (right) practice their presentation for the MediaShift J-School hackathon at the University of North Texas on Sunday, Oct. 22. For example, a student in recovery for addiction could select sober housing and drug and alcohol counseling to find schools that offer those services. Each returned search would also provide users with feedback from real parents and students. So why didn’t the Transition pitch win? I think it did too much. According to Mike Orren, the founder of Pegasus News, who spoke at the event, if you use a lot of conjunctions when you explain your idea, you need to go back and simplify it. Plus, the competition was fierce. One group pitched a mobile app that helps individuals with depression and their therapists track small steps and progress. Another group pitched a female bodybuilding news site that does not sexualize women. Both ideas sprouted from pain points students in each of those groups had experienced. And the winning pitch? A mobile app that helps families eat and live healthier through gamification. That idea came from a group of three, one of whom is a college student and concerned mother.